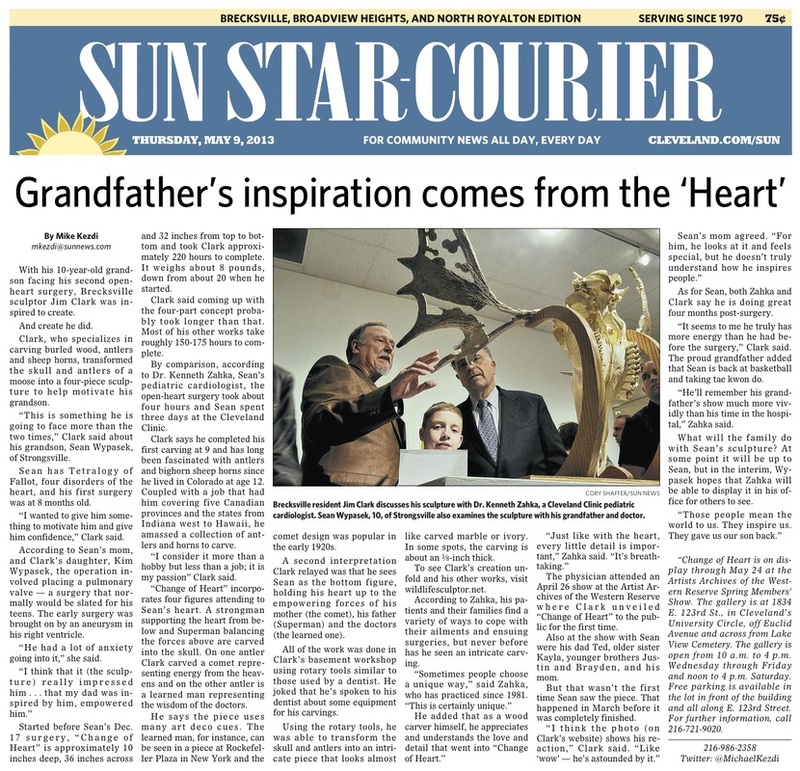 With his 10-year-old grandson facing his second open-heart surgery, Brecksville sculptor Jim Clark was inspired to create. Clark, who specializes in carving burled wood, antlers and sheep horns, transformed the skull and antlers of a moose into a four-piece sculpture to help motivate his grandson. “This is something he is going to face more than the two times,” Clark said about his grandson, Sean Wypasek, of Strongsville. Sean has Tetralogy of Fallot, four disorders of the heart, and his first surgery was at 8 months old. “I wanted to give him something to motivate him and give him confidence,” Clark said. According to Sean’s mom, and Clark’s daughter, Kim Wypasek, the operation involved placing a pulmonary valve — a surgery that normally would be slated for his teens. The early surgery was brought on by an aneurysm in his right ventricle. “He had a lot of anxiety going into it,” she said. Started before Sean’s Dec. 17 surgery, “Change of Heart” is approximately 10 inches deep, 36 inches across and 32 inches from top to bottom and took Clark approximately 220 hours to complete. It weighs about 8 pounds, down from about 20 when he started. Clark said coming up with the four-part concept probably took longer than that. Most of his other works take roughly 150-175 hours to complete. By comparison, according to Dr. Kenneth Zahka, Sean’s pediatric cardiologist, the open-heart surgery took about four hours and Sean spent three days at the Cleveland Clinic. Clark says he completed his first carving at 9 and has long been fascinated with antlers and bighorn sheep horns since he lived in Colorado at age 12. Coupled with a job that had him covering five Canadian provinces and the states from Indiana west to Hawaii, he amassed a collection of antlers and horns to carve. “I consider it more than a hobby but less than a job; it is my passion” Clark said. “Change of Heart” incorporates four figures attending to Sean’s heart. A strongman supporting the heart from below and Superman balancing the forces above are carved into the skull. On one antler Clark carved a comet representing energy from the heavens and on the other antler is a learned man representing the wisdom of the doctors. He says the piece uses many art deco cues. The learned man, for instance, can be seen in a piece at Rockefeller Plaza in New York and the comet design was popular in the early 1920s. A second interpretation Clark relayed was that he sees Sean as the bottom figure, holding his heart up to the empowering forces of his mother (the comet), his father (Superman) and the doctors (the learned one). All of the work was done in Clark’s basement workshop using rotary tools similar to those used by a dentist. He joked that he’s spoken to his dentist about some equipment for his carvings. Using the rotary tools, he was able to transform the skull and antlers into an intricate piece that looks almost like carved marble or ivory. In some spots, the carving is about an 1/8-inch thick. To see Clark’s creation unfold and his other works, visit wildlifesculptor.net. According to Zahka, his patients and their families find a variety of ways to cope with their ailments and ensuing surgeries, but never before has he seen an intricate carving. The physician attended an April 26 show at the Artist Archives of the Western Reserve where Clark unveiled “Change of Heart” to the public for the first time. Also at the show with Sean were his dad Ted, older sister Kayla, younger brothers Justin and Brayden, and his mom. But that wasn’t the first time Sean saw the piece. That happened in March before it was completely finished. As for Sean, both Zahka and Clark say he is doing great four months post-surgery. “It seems to me he truly has more energy than he had before the surgery,” Clark said. The proud grandfather added that Sean is back at basketball and taking tae kwon do. “He’ll remember his grandfather’s show much more vividly than his time in the hospital,” Zahka said. What will the family do with Sean’s sculpture? At some point it will be up to Sean, but in the interim, Wypasek hopes that Zahka will be able to display it in his office for others to see. “Change of Heart is on display through May 24 at the Artists Archives of the Western Reserve Spring Members’ Show. The gallery is at 1834 E. 123rd St., in Cleveland’s University Circle, off Euclid Avenue and across from Lake View Cemetery. The gallery is open from 10 a.m. to 4 p.m. Wednesday through Friday and noon to 4 p.m. Saturday. Free parking is available in the lot in front of the building and all along E. 123rd Street. For further information, call 216-721-9020. Contact Kezdi at (216) 986-2358 or mkezdi@sunnews.com.